When one thinks of scented candles, room sprays and perfumes, Disney isn't the first thing to come to mind. Don't turn up your noses dear friends, this exciting new chapter is going to not only change your mind but your senses as well. Inspired by some of Disney's most beloved stories and characters, the line consists of both home and personal fragrances in addition to unique gifts. The three individual product lines have engaging titles that capture the Disney spirit and releases the inner child in us all. Imagination, a home fragrance, is based off of the Imagination Tree found in Disney Stores. The deep forest scent is calming and delivers the first notes of nature to your home, while never overpowering. Magic, also a collection of home scents, candles and fragrances is a cool scent with a few notes of mint and chocolate. Magic, combines the freedom of children playing outdoors along with the epitome of adventure and the Disney icon, Mickey Mouse. For those looking for a personal scent, the Tinkerbell inspired Pixie Dust is a must have. Whether you're 12 or 42, this citrus inspired scent is refreshing take on the most feminine of all Disney characters. Imagination is currently in stores now and Magic will be available July, you are going to have to wait until Fall for Pixie Dust but it will be well worth it. 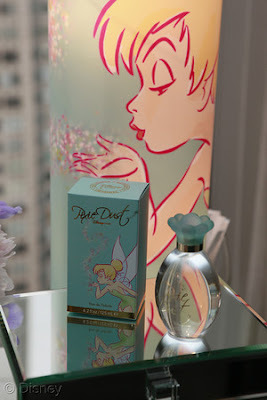 If you're a lover of fragrance like myself, then you will surely love these Disney inspired fragrances. Did I mention the excellent price point, nothing is over $25. I plan on stocking up on a few candles as housewarming gifts. Get started Disney and fragrance fans, head over to your nearest store to open up your Imagination, dabble into some Magic and lighten up with Pixie Dust.